Are you confused about the different camera monopods? Join the club. There are video monopods, monopods for digital cameras, walking sticks, hiking monopods and now the newest kid on the block, the selfie stick monopod? Here's some help with choosing the right monopod. There are monopods that are designed for specific types of uses and then there are a few that are designed to have several uses. This article will give you the 3 options on the features your monopod can have and then the 5 characteristics you will want to look at before you choose the best monopod for your situation. You'll also learn how the many different uses for each type of monopod. There is definitely a limited opportunity to use them interchangeably with some caution and compromise. Each has a definite intended use, but there is some overlapping versatility in certain situations. As a quick example you can see the differences in the bottoms of the two of my monopods below. The camera monopod on the bottom in the photo has the retractable round rubber tip. In most situations for photographers the rubber tip is going to be left extended to reduce the chances of the leg slipping on the floor or the ground. The majority of handles on monopod look like the lower one pictured here. It's a simple foam pad that surrounds the shaft at the top. The grip on a walking stick, the upper one in the photo, wouldn't be functional to support your camera very effectively. I know-I've used walking sticks to steady my camera during hikes and it's not an ideal situation. The handle is contoured to fit your hand more securely in the event that you are supporting a good portion of your body weight to maintain your balance over rugged terrain. Traditional monopods made specifically for walking do not have a mounting screw on top to secure your camera, but there are some that do. You certainly can rest your camera on top of a walking stick for stability in a pinch. You can't let go of your camera or your monopod which sure makes it a real challenge to make adjustments to your camera settings. If you are walking in the woods, you may be able to use a tree to rest your camera against. Combined with monopod support underneath your camera and you have multiplied your stability. The 2nd option to consider when choosing a camera monopod is the head. Cheaper monoods come wioth no head at all, just the mounting screw. 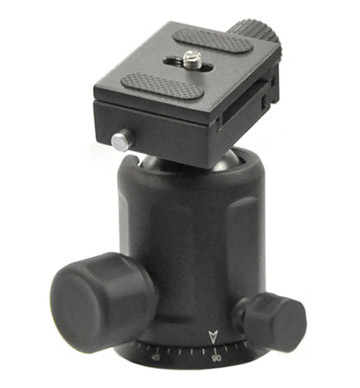 Fluid heads are a more desirable option to have on video and camera tripods than just a simple mounting screw. This adds a bit more weight to your equipment but gives you added versatility. 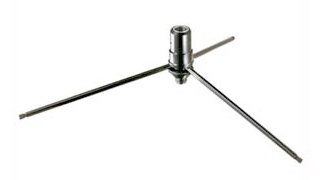 Hikers can walk and use camera monopods with fluid head attached but it does throw off the weight and balance. This will make it your monopod-walking stick a little top heavy. This fluid head is compact and does not have the typical screwdriver-type of handle that gives you finer control over panning and tilting movements. The 3rd option to be aware of is the presence or not of monopod feet. 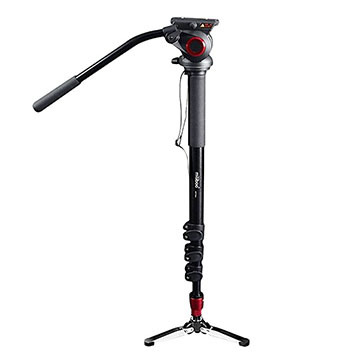 Many monopods that are marketed as video monopods come with the short folding legs or feet. I call these pseudo tripods because of the three short legs that give you added stability. They are a good compromise between a monopod and a tripod are very popular with videographers. A big advantage to the video monopod with the 3 feet is the ability to pan smoothly and follow side-to-side movement in a more continuous manner. What features do you need to look at specifically to figure out if a monoid is a good fit for you? Here are the 5 main characteristics you need to consider. 1. HOW MUCH DO MONOPODS COST? Price is one of the biggest factors people focus on first. News Flash: That's human nature and we're all guilty of doing that. Just don't forget the durability and usability have to be considered too. The old adage that you get what you pay for is generally true, but it's extremely important to think about two other things as well. Specifically the kind of photography you are doing and the camera-lens combination that you are shooting with are just as important. If you use your monopod only when you're shooting video your choose for the best monopod will be different than mine. I use my monopod for shooting portraits in low light situations and for shooting wildlife, specifically bird photography. Prices range from about $350 for a Gitzo 6-section, 6x carbon fiber Traveler Monopod to around $11 for the cheapo plastic, no-name brands. These very affordable monopods can often do the job for a point and shoot camera or a compact DSLR camera when it does not have your heaviers long telephoto lens attached. If the pricey monopods are more than you need, you're better off looking at some of these budget monopods, all priced for less than $50 at the time this article was written. Usually people who buy these cheaper are not serious photographers and they are not overly surprised when their monopod breaks or becomes worn very quickly. A good monopod for most people is a happy medium somewhere in between. Many of us would like to take a tripod everywhere, but there are many times when it is not practical or even allowed. At many sporting events, stadiums, race tracks, tennis courts, museums or botanical gardens, tripods are forbidden. Tripods can be annoying and can be hazardous where people may trip and fall. So finding one of the best monopods is important to your photography when a tripod is not going to work for you. You'll still need to support your camera, get blurry-free images, and save your arm or back muscles. 2. HOW MANY SECTIONS SHOULD YOUR MONOPOD HAVE? One of the important, but often overlooked features to compare is the number of leg sections. Higher end monopods typically are manufactured with more leg sections than the cheaper models. It's great to have the least possible number of sections when you're adjusting the height. More collapsible sections means you can compact it to a smaller length and that allows you to transport it easier. 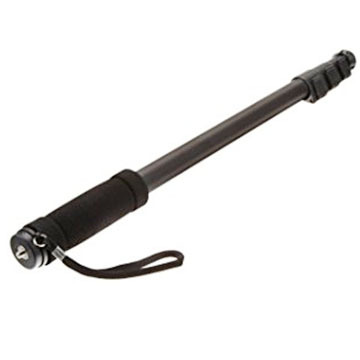 If your collapsed monopod is too long it becomes tougher to carry it around and you'll want to leave it at home. 3. HOW HEAVY are camera monopods? Compared to tripods all monopod are quite light. Generally, the heavier your monopod is, the sturdier it will be. Thicker legs will have more stability, but at the cost of weighing more. 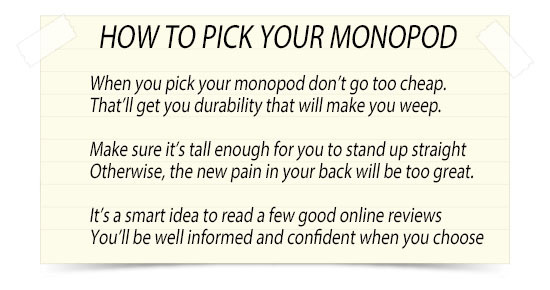 Weight is an important consideration when choosing the best monopod. Sometimes you'll really want to travel lightly. Hiking and backpacking are good examples. If you're carrying everything on your back that you need, you know every single ounce counts. Compare the weights of different monopods. You will see that there is quite a bit of variation in how much they weigh. Heavy duty monopods can weigh more than lightweight tripods, depending on the material they are made with, as well as the size and what accessories they have attached. 4. HOW TALL CAN YOUR MONOPOD GO? Height. How high do you need it to go and how small do you want it to collapse? Measure the distance from the ground to the level of your eye. Anything shorter than that is no good. Not only is it difficult to use your monopod if it's too short, but it's bad for your posture and the health of your back. When you extend the legs out to 100% of their maximum, you will lose some stability, particularly with the monopods with thin columns. This article on how tall your tripod should will help you figure out the best height for your monopod. 5. WHAT TYPE OF HEAD SHOULD YOUR MONOPOD HAVE? The type of monopod head has a huge impact on how well it functions for you. Ball heads are clearly the best monopod head to have unless you a significant amount video. Without a head you're limited in angling your camera to shoot at an up or down angle without leaning your monopod to a less stable position. Right now, at the time of this post update, it's a challenge to find a monopod without feet that does have a simple ball head included. Monopods with feet are a little more geared toward video shooters and usually have a fluid monopod head with long screwdriver type of handles. I've used my Koolehaoda monopod with it's small ballhead plenty of times for still photographs. I just added this list of the 4 best monopods based on some more research. These are the highest rated monopods, limited to mid and high-priced monopods, for DSLR cameras. 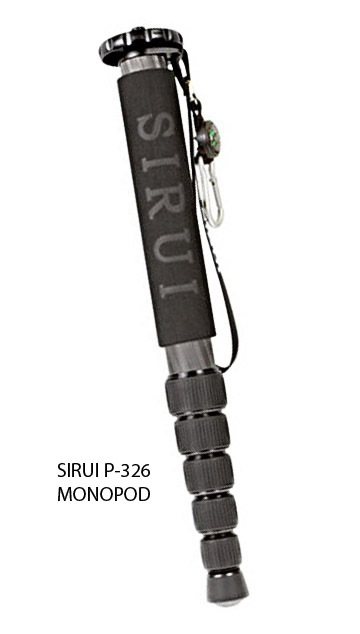 If you are looking for a good monopod for a light point-N-shoot type of camera these monopods are too much. 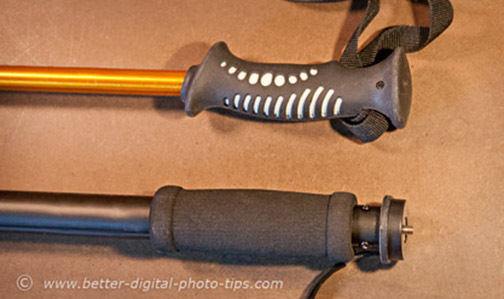 These monopods got the highest ratings as well as had the highest number of reviews given. That's very significant, because it means you are getting a lot of reviewers who are all quite positive about each of these monopods. What are the most popular, best selling monopods? They happen to be the the cheapest monopods. No surprise there. If you're like the rest of us, you like to spend as little as possible for camera accessories. Many beginning and hobbyist photographers are shooting with point and shoot cameras and don't have a huge budget for an expensive camera monopod. That's great, provided the cheapest accessory does the job for you. Both the Dolica WT-1003 and the Amazonbasics 67 inch monopods are priced at less than $20 and they both receive a lot of positive reviews. These are light-duty tools, made economically, but still quite functional when used and cared for properly. I have the Amazonbasics monopod, that I received along with a portrait backdrop, and it serves me well. 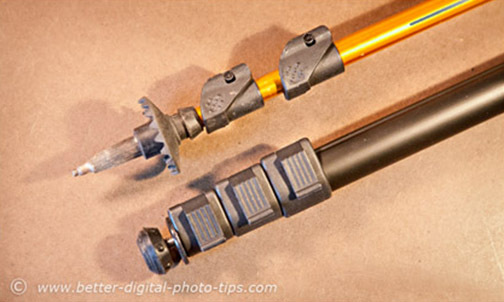 The only issue you want to avoid can arise if you over-tighten the plastic ring on the top of these types of monopods. Plastic parts can break. If the metal mount screw breaks it's mooring within the plastic ring, you've may a big issue on your hands, It can be near impossible to remove the broken monopod attachment ring, because the mounting screw will spin freely inside. The Sirui P-326 is a higher price option. It's one of the highest rated products of any kind you'll ever find. When 85% of buyers give a product a 5-star rating, you know it's a pretty impressive product. 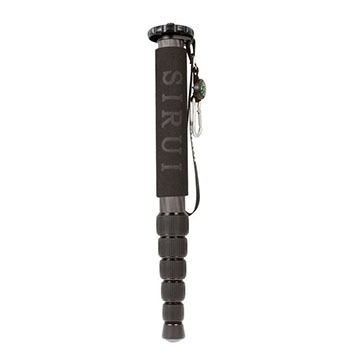 The Sirui is extremely well designed and made with the best materials and precision engineering. Its much higher price tag shows that. How to Use a Monopod. There are a few specific tips and techniques to get the most out of your monopod. Monopod Tips. This article starts with a video on when to use a monopod. Better yet, it then gives you four ideas on how to get the best results with your monopod. Monopod Advice. 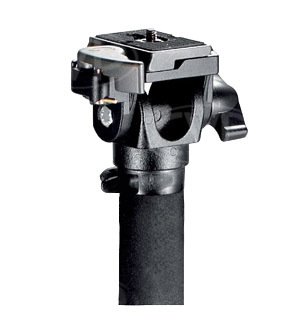 For shooting video, retractable feet and an adjustable fluid head is the top notch way to go. 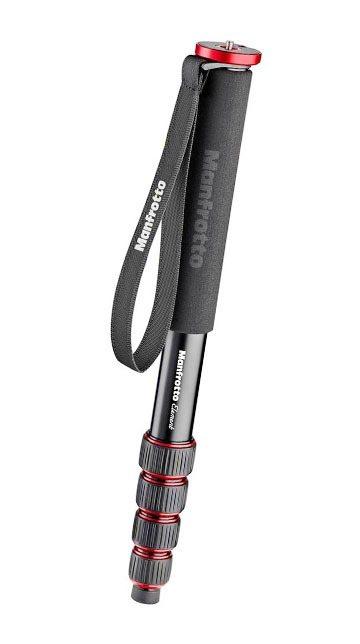 Versatile monopods that act like or combine with tripods and are good for hiking. You have a few options if you want to travel light and be fully prepared for any kind of subject when you're out on a photo shoot. Even if you are already experienced on how to use a monopod, you can pick up additional tips and ideas by reading the above articles. There are dozen of these articles relating to camera monopods. Take advantage of them while you are here. The best monopods for the serious hiker come with an optional compass. 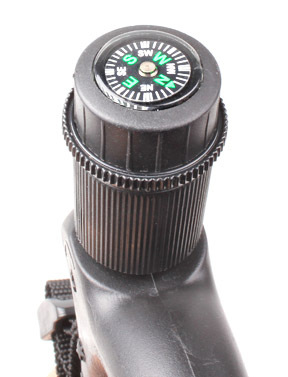 It is convenient to have the compass screwed onto the top of your walking stick monopod and be able to remove it for a quick photo of your subject. Modern hikers are now using GPS systems to navigate their way through the woods. Perhaps there is something about using a traditional compass when you travel through the woods that is more natural. One final tip: Remember that camera monopods are designed to support the weight of a camera and many are not safe to use to support a good percentage of the weight of a human being.